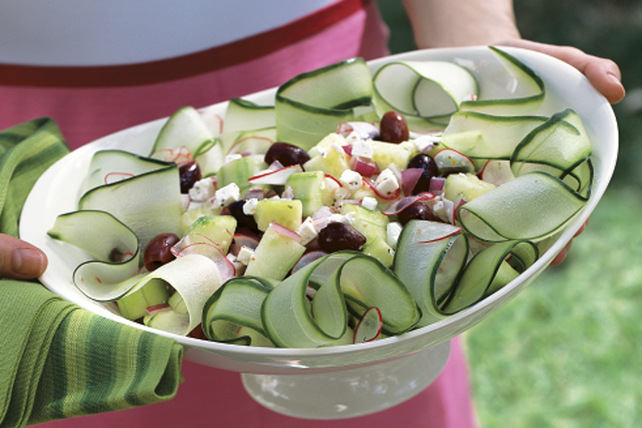 Delicate cucumber ribbons look impressive and are easy to create by using a vegetable peeler. Slice 1 of the cucumbers into long thin ribbons using a vegetable peeler; set aside. Peel remaining cucumbers; cut into 1-inch cubes. Toss with remaining ingredients. Place mixture in centre of serving platter. Arrange reserved cucumber ribbons around edge of platter. Try using English cucumbers in this recipe. They are available year round with the peak crop from May to August. They can grow up to 2 feet and are virtually seedless. Store whole cucumbers, unwashed in the refrigerator for up to 10 days. Save 2 g fat by substituting Kraft Calorie-Wise dressing for the regular product.